NASCAR meets John Deere at the National Lawnmower Racing Championships. Maneuvering a lawnmower through a waterlogged track is like trying to ride a bicycle on ice. Bruce Kaufman -- aka "the Sodfather" -- studies the soggy field at the Richland County Fairgrounds. He is debating whether to postpone the National Lawnmower Racing Championships. To postpone would be rather inconvenient. Around 90 of the country's fastest lawn jockeys have converged in Mansfield, about an hour south of Cleveland. The best among them have been practicing all year, in hopes of capturing the title of nation's fastest ride-on-lawnmower driver. But maneuvering a lawnmower over the waterlogged track is like trying to ride a bicycle on a sheet of ice. It requires more luck than skill. "This ain't racing," complains three-time national champ George Herrin, as he hoses down his muddy mower. "On a dry track, this would be a dogfight until the end. On this track, it's whoever survives." But it quickly becomes clear that Kaufman doesn't share that view. "Ladies and gentlemen," he announces over the PA system, his game-show-announcer's voice booming its message to the dozens of soggy fans. "The mow must go on!" The contest began as a publicity stunt back in the early 1990s, when Kaufman was trying to promote a lawnmower-fuel company. 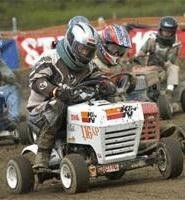 And while Kaufman is the first to acknowledge that lawnmower racing shouldn't be taken too seriously, the annual event has since taken on the trappings of a legitimate sport. "Other unaffiliated groups have an 'Anything mows' kind of approach to racing," says Kaufman, who in addition to creating puns also helps police each race for violations of any of the league's hundreds of Byzantine rules. Riders compete in six different divisions, featuring everything from run-of-the-mill Home Depot-bought mowers to custom-built powerhouses that are as fast as cars. One rule: All race vehicles must be capable of actually cutting grass. "We want people to see our mowers and have no doubt that they're lawnmowers," Kaufman says. The main attraction is the chance to celebrate white-trash culture in all its mulleted splendor. For gearheads, it's a once-a-year opportunity to make a hell of a lot of noise and go really damn fast. "No one pays attention to you if you just roll up to a bar on a Honda," says racer Bobby Cleveland (aka "Sodzilla"). "You want to arrive there making noise." Before long, it's time for the biggest race of the day, during which average speeds can reach more than 60 mph. Early favorites include Chuck Miller ("Mr. MOW-hio"), a speed demon who's competed in every national competition since the race's inception 15 years ago. Then there's Cleveland, the most decorated lawnmower racer in the sport's brief history -- this year, on the Fourth of July, he broke the U.S. lawnmowing speed record by hitting 81.2 miles per hour at the Bonneville Salt Flats in Utah. Also looking promising is Herrin, who's on the hunt for his fourth national title. But anything can happen when Floridian Jayson Mikula is on the track -- last year, he was a lap away from winning when a collision caused his mower to flip. A few minutes before the race, the painted mowers -- which look more like bumper cars than landscaping equipment -- line up at the starting line. In the stands, the racers' wives hold their children's hands tightly as they seek out their husbands, who are wearing NASCAR-inspired helmets and racing suits. "Look, there's Daddy," Mikula's wife says to her young daughter, who's swimming in an oversized gray hoodie. On the track, the riders adjust their goggles. The racing official holds up a green flag. "Ready! Set! Mow!" he cries. The mower's tires kick up a muddy tsunami. Miller takes the early lead. As he motors around the bend, he flicks dirt from his aviator goggles. Miller rounds the corner of his sixth lap when suddenly -- ka-runch! -- his engine seizes up. He's forced to jump out and push his mower off the track. Mikula takes the lead. He leans his whole body and head forward, like an oversized jockey as he sails smoothly around the curves. But Herrin is right on his back, riding the bumps in the track like a surfer. Fans in sweatshirts and rain slickers cheer his name. On the last lap, Herrin makes his move. He tries to pass Mikula on the right, but finds himself stuck behind a lapped driver. Mikula crosses the finish line first, earning a checkered flag to wave during his victory lap. His wife jumps up and down, hugging everyone near her. "He won! He won!" she yells. In his trailer, Bobby Cleveland, who finished a disappointing sixth, takes off his helmet. "The track was slick at spaces," he says. "It was hard to go around the other riders, but it was lots of fun." "Well, at least your lawn must always look good," someone offers. "Oh no, my girlfriend won't let me near it," Cleveland replies. "She says I tear up the grass."